In amongst the frenzy of the Fringe, is an understated array of talent hidden away in a pub you have to be looking for to find. “I was just cutting through from West Street to The Lanes and I stumbled across it,” said one chap, of the Fiddler’s Elbow (Boyces Street). 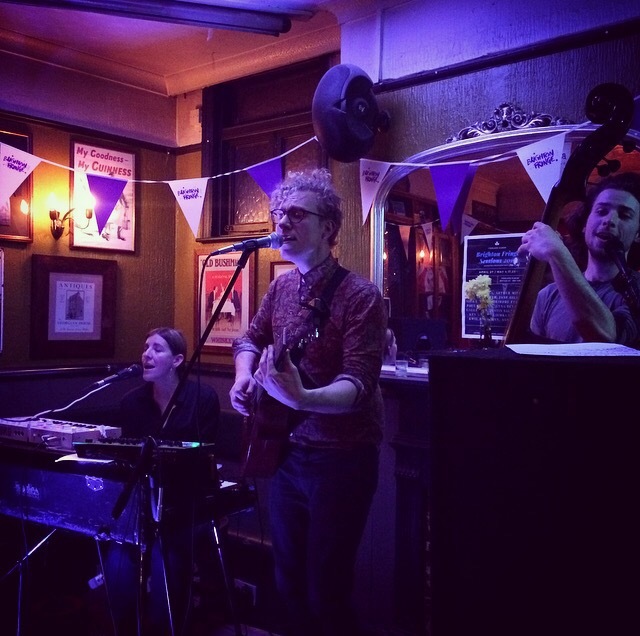 It just so happened that said chap was lucky enough to stumble into the welcoming Irish pub during one of their Folk Off Sessions, which become a weekly event every Thursday during the Brighton Fringe. On this particular Thursday, the evening began with the gravelly-voiced Justin Saltmeris, accompanying himself on the guitar. But Justin has more than gravel to his voice; he is a powerhouse, vocally and his voice easily filled the tiny pub with an unwavering mix of strength and melody. Jane Gilbert followed, with her slightly haunting folk songs, treating us to her talented voice with a clarity that is reminiscent of the gentlest of bells. The popular Night House were the third act to entertain us, featuring the distinctive Nick Williams and his boundless versatility. Hopping from keyboard (complete with synthesiser) to guitar and throwing a drum machine into the proceedings, evidently adapting his style throughout his own set, this is a musician who can reinvent himself in the space of 45 minutes. Not only does Nick have complete mastery over a complete orchestra of instruments, but also he has a vocal range that would be the envy of any artiste: male or female. His style is folk meets rock with a surprise visit from synthesised sounds of the ‘80s and the result is a juxtaposition of nostalgia and music with a sci-fi slant (well, it sounded sci-fi in the ’80s). Treating us to his own songs – ‘Fade Away’, ‘Sea Ocean’ and ‘Back Out’ topped my list – it is difficult to fathom that his set was only 45 minutes long, as he showcased too much talent, surely, for one musician. Kwil, a four-person folk band, rounded off the evening with their beautifully confident harmonies. The last band to play at a showcase night risks playing to a depleted audience, as people start to wend their way out of the venue; but the presence of a thronging audience was testament to their very listenable music. “Will you come here again?” I asked Lucky Chap. “I doubt it,” he shrugged, to my surprise. And he stumbled back out as the May mist swallowed him up. So the Fiddler’s Elbow Folk Off Sessions really are such stuff as dreams are made on, it would seem. Last Fringe session next week, so find out for yourself. ‘Like’ them on Facebook to keep track of their regular sessions and all the bands have FB pages too. Reviewed by Lisa O’Connor at the Fiddler’s Elbow on Thursday May 4th 2017.